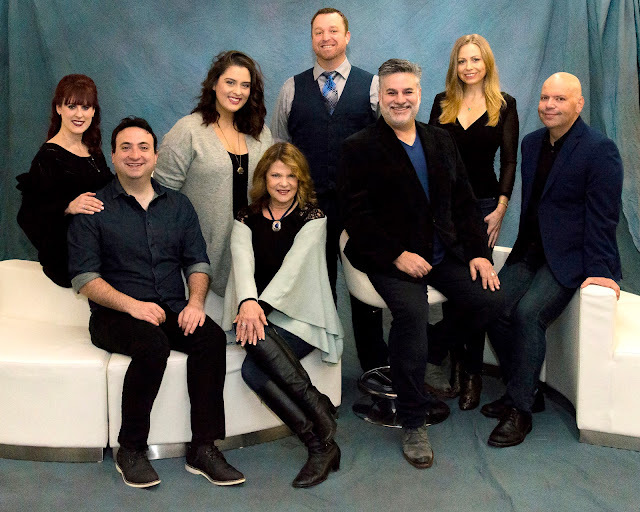 When it comes to musicals and plays, we are fortunate to have the Center for Performing Arts with Broadway San Jose, The San Jose Stage, and the Children's Musical Theater. Now we are lucky to have another venue to consider! On Thursday, January 18, 2018, 3Below Theaters & Lounge officially opened its doors to the public as they welcomed patrons to the musical: Sondheim on Sondheim. You can read their press release on The San Jose Blog here. As we covered about the closing of Camera Cinemas (Part 1 and Part 2) along with options for the Camera 12 Cinemas, it’s been a heartbreak for many of us wondering about the future of these properties. However, a glimmer of hope came alive when it was announced that the property, formerly known as Camera 3, was to be renovated and revitalized! Arriving early to take pictures and look around, I was excited when they decided to let people in to see the musical in Theater 3. I found out that I was the first official patron to set foot in Theater 3! As you can see by my panorama, Theater 3 is a multipurpose theater for musicals, plays, movies, operas, cabarets, concerts, and a coveted screening room for Cinequest Film & VR Festival. You can find more about the other two theaters yet to be completely remodeled on their website under Who We Are, including an “intimate 87-seat theater” and another theater which will be the homebase to ComedySportz! Of course, it’s also not everyday that you get to sit in a brand new theater. It doesn’t quite have a new car smell but the room feels and smells so clean with brand new wall coverings and lighting; beautiful new seats; and fortunately, gum, scuff marks, or food on the floor were nowhere to be found! As for Sondheim on Sondheim, the musical is a big nod and honor to Stephen Sondheim, a famous American composer and lyricist best known for his work on Company, Follies, West Side Story, Sweeney Todd, and Into the Woods. The musical is on a limited engagement until February 4 and you can purchase tickets here. 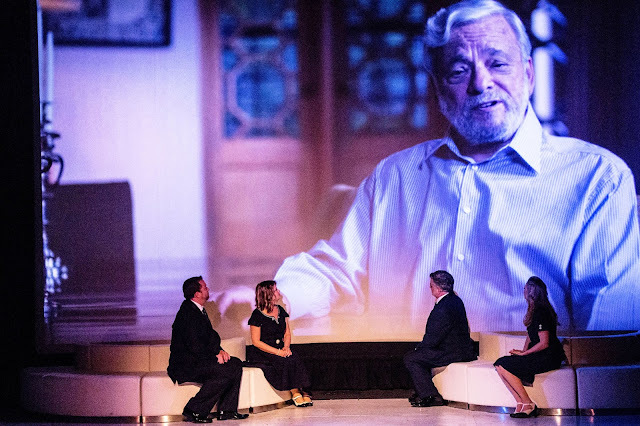 With movie clips showing interviews of Stephen Sondheim featured on the big screen alongside cast members live on stage singing, dancing, and acting out many of his musical numbers, it was great to appreciate this living legend, or as some call him – “God”, for his work, sense of humor, and personal life. Under the direction of Guggenheim Entertainment, the cast members performed well. Theresa Anne Swain and Amy Bouchard amused us with their interludes of “The Wedding is Off” and “Bless This Day”, respectively, from the musical Company. Given his work as an opera singer, Stephen Guggenheim nailed “Epiphany” from Sweeney Todd. Jim Ambler amused us with “Franklin Shepard, Inc.” from Merrily We Roll Along. Then we had two deep and emotional numbers from Passion: “Is This What You Call Love?” and “Loving You”; both were performed eloquently by Jeremy Kreamer and Susan Gundunas, respectively. Martin Rojas Dietrich sang a number that many of us can relate to in life called “Being Alive” from Company. And Hayley Lovgren’s performance of “Do I Hear a Waltz?” from Do I Hear a Waltz? made me want to get up out of my seat and dance along to the waltz rhythms. After all the musical numbers were finished, I began to not only appreciate Sondheim’s lesser known works including Road Show (previously Bounce/Wise Guys), Merrily We Roll Along, and Passion, but also appreciate and empathize with his struggles in life including his psychologically abusive mother. All in all, 3Below has done a great job and I’m excited for their upcoming renovations of the other two theaters and additions to the lobby dining area including their Pix & Pints Cafe for dining options before, during, and after events. We will certainly be coming back and can’t wait to see another musical, play, movie, show, sing-a-long, or ComedySportz! They will win my heart, any day, if they are able to have a classy cabaret show or a jazz concert with some great wine and h'orderves. Great job 3Below Theaters & Lounge!